What is Applied Behavior Analysis (ABA) ? ABA is short for Applied Behavior Analysis, and it is often described as the "gold standard" for autism treatment. Applied Behavioral Analysis (ABA) is a system of autism treatment based on behaviorist theories which, simply put, state that desired behaviors can be taught through a system of rewards and consequences. This training program is designed for the family members and parents of children diagnosed with autism. Caregivers will learn a variety of evidence based practices to decrease challenging behavior and teach new functional skills to their child. This training program is based on the Registered Behavior Technician Task List® and is designed to meet the 40-hour training requirement for the RBT® credential.The course can be completed in as little as 7 days (180 day max). Schedule your Orientation today. Ask Questions. Find out if Remote Supervision is right for you. Talk to a BCBA today by calling 888-832-8919. 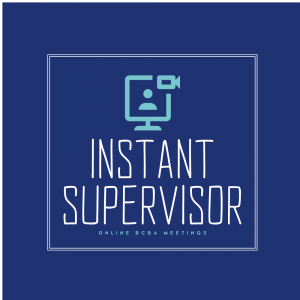 Instant Supervisor and ATCC subscriptions are month-to-month. If you need to cancel your subscription at anytime, please just click this button, use the "Easy Cancel" page and we will immediately cancel your subscription for you. We do not have any contracts and you may cancel your subscription at anytime with no questions asked. Provides ALL of the requirements to take & pass the RBT Examination with the BACB®. Includes the 40-Hour Curriculum, BCBA® Administered Competency Assessment, BCBA® Administered background check, Live Weekly BCBA® Instructor Meetings, Exam Study Resources, Resume Building & Career Placement Assistance. Limit 20 student enrollment. Provides ALL of the requirements to take & pass the RBT Examination with the BACB®. Includes the 40-Hour Curriculum taught live, BCBA® Administered Competency Assessment, BCBA® Administered background check, Exam Study Resources, Resume Building & Live Client Practice in the On-campus Success Clinic, Guaranteed Job Placement. Limit 10 student enrollment. we’ll welcome you with open arms.